MINNETONKA, Minn., March 9, 2016 – The new $1 million 8,300 square-foot laboratory at NatureWorks world headquarters is the latest milestone in the company's multi-year program to commercialize a fermentation process for transforming methane, a potent greenhouse gas, into lactic acid, the building block of Ingeo™ biopolymer. NatureWorks is hiring six scientists to staff the new facility. The methane to lactic acid research project began in 2013 as a joint effort between NatureWorks and Calysta Energy™, Menlo Park, Calif., to develop a fermentation biocatalyst. In 2014, laboratory-scale fermentation of lactic acid from methane utilizing a new biocatalyst was proven, and the United States Department of Energy awarded $2.5 million to the project. In 2016, the opening of the new laboratory at NatureWorks headquarters marks another major advancement in the journey from proof of concept to commercialization. 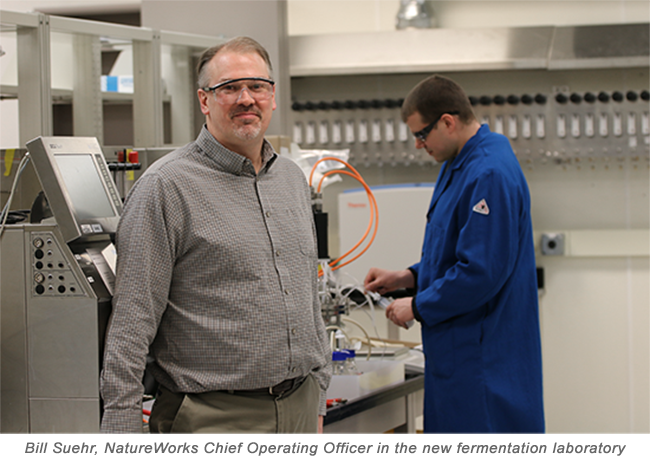 "A commercially viable methane to lactic acid conversion technology would be revolutionary," said Bill Suehr, NatureWorks Chief Operating Officer. "It diversifies NatureWorks away from the current reliance on agricultural feedstocks, and with methane as feedstock, it could structurally lower the cost of producing Ingeo. It is exciting to envision a future where greenhouse gas is transformed into Ingeo-based compostable food serviceware, personal care items such as wipes and diapers, durable products such as computer cases and toys, films for wrapping fresh produce, filament for 3D printers, deli packaging, and more." Based on the research collaboration between NatureWorks and Calysta, NatureWorks hopes to subsequently develop a 25,000 square-foot pilot plant in Minnesota by 2018 and hire an additional 15 employees. Within the next six years the company is looking at the possible construction of a $50 million demonstration project. It's conceivable that within the next decade NatureWorks will bring online the first global-scale methane to lactic acid fermentation facility. For more information about NatureWorks and Ingeo, visit www.natureworksllc.com. Follow NatureWorks on Twitter (@natureworks) for the latest updates. For more information on Calysta, visit www.calysta.com. NatureWorks LLC is a company dedicated to meeting the world’s needs today without compromising the earth’s ability to meet the needs of tomorrow. NatureWorks LLC is the first company to offer a family of commercially available, naturally advanced low-carbon-footprint Ingeo™ lactides and biopolymers derived from abundant local resources with performance and economics that compete with oil-based intermediates, plastics, and fibers, and provide brand owners new cradle-to-cradle options after the use of their products. NatureWorks is jointly owned by Thailand’s largest chemical producer, PTT Global Chemical, and Cargill, which provides food, agriculture, financial and industrial products and services to the world. For general information on NatureWorks and Ingeo, visit www.natureworksllc.com.